Here's this years wordle about from my blog posts. This is tradition to me and here are my previous wordles (2010, 2011 & 2012). Word cloud reveals what has been obvious to me the whole year, I've been mainly writing about books. 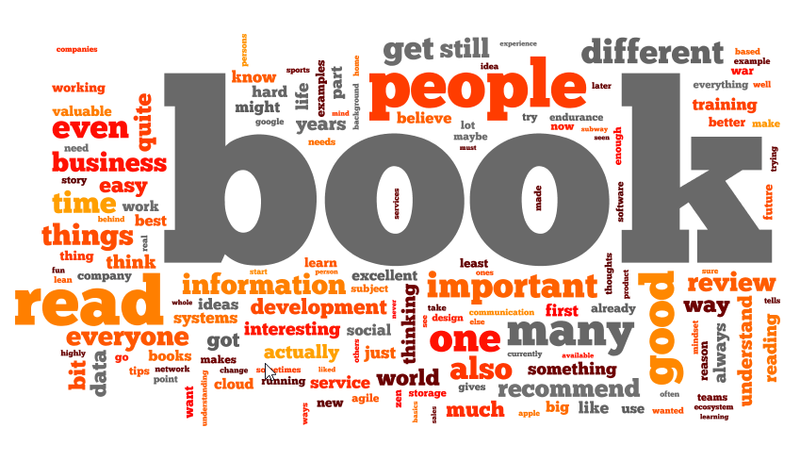 Because book stole so much from my words, I decided to do another wordle without the word book on it. I also took some other obvious words away from the cloud to see what really have been the subjects in books and other posts that have been raised up. 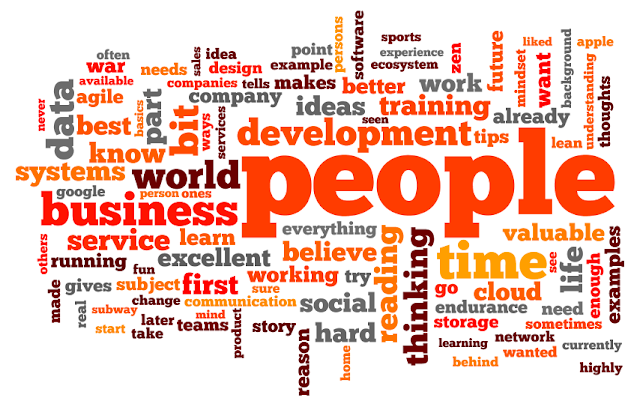 I was gladly surprised to see that people, business, development and world raised to be such a popular words. Also there were words like ideas, systems, thinking, training etc mentioned so many times. It is fun to see in this format what I really have been writing. My blogging frequency have been going down from past years a bit this year. After the first months of 2013, I've been mainly blogging about books. I managed to read around 30 books, so I at least blogged from all of those. Here's a review of what has happened in my blog this year. Which were the most read blog posts and which were the posts I personally liked the most. Market Analysis - Cloud storage in ecosystem war? I thought the whole "do not disturb"-icon post was so silly, that I almost didn't publish it at all. It shows that the simplest posts sell. I guess from Book Reviews Service Design book got there due to my critical view about the book. If I would be looking for readers, I should be writing critically about books and making half funny posts. I do this blogging for my own fun, so I think I'll keep writing the same stuff than previosly. I had bit trouble with my health this year and even though I completed my firsts half-ironman, I still was sick a lot. And when I'm sick, I can't really write. I hope next year will be much better and I'm writing much more about other things than just books. And certainly I will be writing about books. work there. That said, my review of the book is bit biased since I know bit more about the company than regular reader will. CRF Health was founded to solve the problem of using paper and pen to get information from patients during medical studies. Most of us have at some point answered some medical questionnaires in paper and this company has focused on using tablets and mobile phones for this data gathering. In this book there are many medical companies mentioned, but it doesn't go in to too much details of how the stuff technically works. This book tells more about the mental side of building a start-up. Timo Ahopelto writes in quite living way and story goes forward really rapidly, almost too fast. Some times I found myself wondering what happened to this and that which was mentioned earlier in the book. There are few loose ends in the book, which I would have liked to get an answer at some point. Book is fun to read, but it mixes serious things with comical aspects so that I got bit lost about the idea behind the book. At first I thought it as teachful real life story, then bit as guide for new start-ups, also at some point it takes a bit political viewpoint and at the end it turns more to the the fictive side. I enjoyed all the sharp observations and opinions about start-ups and business life what Timo Ahopelto brings up in the book. Those small, one or two paragraph mentions, were really good additions to the book. 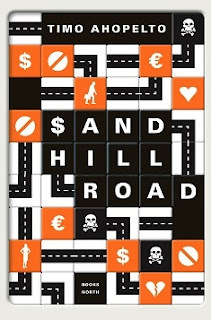 I would like to read more of Timo Ahopelto's thought about business life and start-ups. I recommend this book to at least all the Finns interested in different businesses and companies in Finland. It's hard to say what percentage of the book is fictional and how much of it is true. Still I believe it gives good view on what it might be to create successful company. It's an entertaining story, so it's easy and fun to read. It's a story of Finnish start-up success and that makes it important for so many. P.S. I believe the book is currently only published in Finnish and I read it in Finnish. 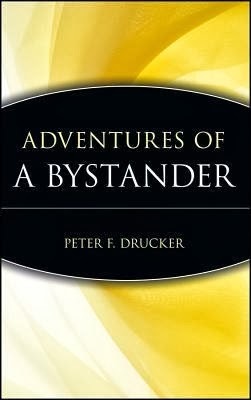 Adventures of Bystander was not a book I would have selected to be read myself, but when I got the book from my sister's husband when they moved abroad, I decided to read it. 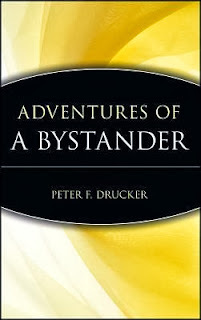 Author Peter F. Drucker was somewhat familiar to me, but this book was not. Peter Drucker is famous management thinker, so I had expectations that this book would have had more about management. It really didn't. It's a book about Mr Drucker's life and interesting people he had known. And he really had known many important persons from 20th century. Book tells about interesting people, but also about life during and after World War II. Drucker is originally from Vienna and left Austria bit before nazis conquered the city. He lived in London and New York and worked with many magazines, universities and interesting companies. Some people introduced in the book are genuinely interesting, others seem to mentioned because them being famous. The interesting people were interesting to read, the famous people not that much. Book is divided to the stories going Mr Drucker's life through quite chronologically. Of course people are followed through their lifetime, but stories start from Drucker's order of knowing the people. History is important and quite often interesting. Sometimes it's just plain boring with lots of names and happenings on politics. Time to time I was really keen on reading and sometimes I couldn't cared less to read. That summaries my thinking about the book. Half of it is really good, half quite boring. It's difficult to recommend this book. If you are fan of Peter Drucker it's a must book to read. If you like history of Europe and US after 1930, this is a good book. If you like biographies, it's a different one and you might like it. For me, it wasn't that good. People have this inbuilt instinct of keeping stuff in case those are needed later. In work life this is seen so, that everything needs to be documented in order to use it later. In some companies this grows to be part of company culture. There are thousands of notes waiting for further use. Documentation as such is not waste. There are many things that should be documented for later use. The hard part is selecting what is important. In many cases this selection is not done, but almost everything gets documented for further use. This starts to increase waste and eventually become a real burden to any organization. This kind of company culture enables fire and forget mentality. It enable important issues to be set aside, because those are documented and will be handled later. This gives the false security that because I documented this important thing to the list of important things, it is not my responsibility anymore to take care of it. This fire and forget mentality connected to high documentation culture creates environment where people get frustrated, start to blame the organization and even become bitter in the long run. As an example I've heard so many times, that someone proposed something to the documentation system and because no one took care of it, this problem now arrived. Even them saying something like the example, they don't understand the fallacy they have fell in to. Organizations which rely less on documentation and more on individual responsibility, will actually get things done. Offering ways to move responsibility to documentation systems creates waste. It creates the false security of having things under control.